As part of a new protocol I’m following, I’m doing a whole lot of serious juicing. Soon after starting SCD I did some juicing (see here for info about juicing on SCD) because I couldn’t tolerate many vegetables or fruit. It was nice to have a refreshing raw vegetable taste after all the soups and stews. I was only drinking about 4-6 ounces at a time and not every day. The GAPS diet recommends juicing a few cups every day right from the intro stages. I never really adopted this practice since by the time I found GAPS I was already feeling quite a lot better and could tolerate some vegetables. Now, in order to get as many nutrients as possible I’m trying to drink a lot of juice. Since I’m at work all week and can’t possibly go through the process of juicing and cleaning up multiple times a day, I’m preparing all my juices on Sundays. Freshly pressed juice does not last that long, even in the fridge, without a bit of help. I have been storing the juice in mason jars that are vacuum sealed, which removes the air and keeps the juice fresh longer. This way the juice will keep for a week or more. 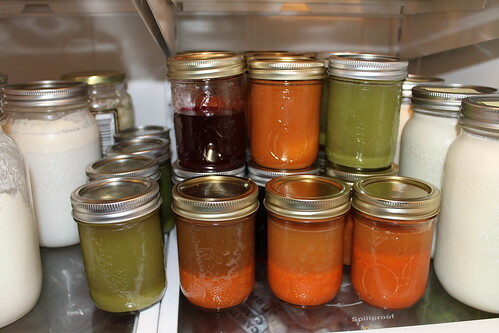 I prepare the juices in one day and all week I can just grab a jar out of the fridge and bring some with me to work. I use my KitchenAid Stand Mixer with the Food Grinder attachment to grind up vegetables and fruit to a wet pulp. Any food grinder or even a blender like the Vitamix can be used for this step. I keep a juicing or nut milk bag and large measuring cup underneath to catch the pulp & juice. I place the bag into a juice press and the measuring cup below to catch the juice. The hydraulic press gets a lot more juice out of the pulp than any juicer will. 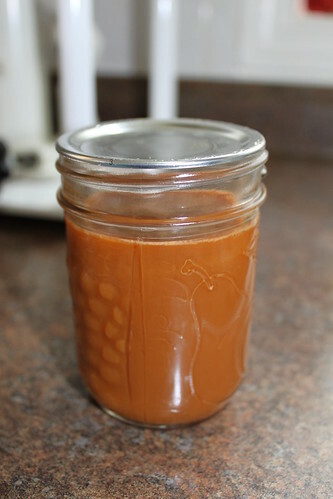 The juice is poured into 250ml mason jars and then vacuum sealed. 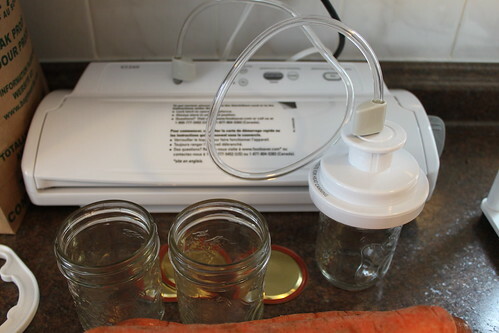 I use the FoodSaver Vacuum Sealer with the Jar Sealer attachment. This step removes all the air from the jar so that the juice will stay fresh for up to a week in the fridge if unopened. And after a few hours of that, I have all my juice ready for the week! Ann Marie of Cheeseslave.com said she used to ferment her fresh juices to help keep them longer when she was doing GAPS. Just put a bit of kefir of whey and leave it to sit out for a few hours before transferring to the fridge. This technique certainly helps make juicing easier! Ooo, that’s interesting! We had tried juicing in big batches for a while when we were starting GAPS (I’ll admit that I slacked off, I hate cleaning the juicer) but I had stopped. I was frustrated at how my juicer didn’t seem to get as much as it could out of the pulp, and I had never even heard of a juice press like that! I’m going to start that up again! Ahhh, and then I just followed the link to the juice press. Pricey! I’m sure it’s worth it in the long run, but that’s a lot upfront~! @Cara Yeah I had a juicer similar to yours and it was great for 1 or 2 cups every now and then. But for big batches it was so tiring. And the pulp I was removing from the juicer was so wet, it definitely wasn’t getting all the juice out. A juice press is worth it. I wonder if you could even make one, you just need the hydraulic jack (off an old car? lol). 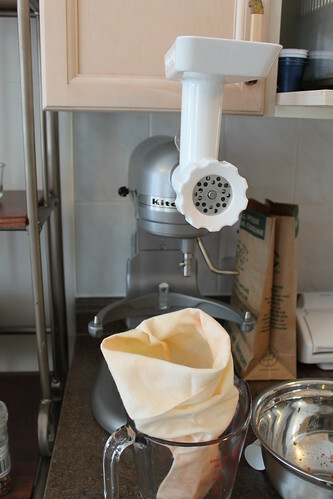 If you do just grind and then wring it out of the nut milk bag by hand, you would probably still get more than a regular juicer. I’ll have to see about getting a nut milk bag and trying that! Have you had experience with a Champion Juicer? A little less expensive than your press, but I’ve heard good things about them. Is it possible to leave a link to the juice recipes you make? I would like to try some of those! @Cara I was recommended the Champion Juicer by the health food store owner who ended up selling me the press. He highly recommends it. That plus the vacuum sealer would be a lot better than using a regular juicer. Nut milk bags are great to have, or many layers of cheesecloth can work too. @Cheryl Rector I’ll see if I can find a link to the recipes, if not I’ll post some up. The orange is just plain carrot juice. I also do carrot apple, and some mixed green juices. I loved the vacuum sealed jars idea! @Angela B Do you drink the juice with fiber in it? I’ve never been able to do that as it always gives me an upset stomach. Maybe fermented it would be better though. I LOVE this idea! I’m wondering if this technique (the vacuum sealing) would work with green smoothies as well? It would probably work with anything mostly liquid stored in a mason jar. You can also vacuum seal dry food in bags/plastic. Thing is, juicing is a more laborious project than making smoothies, so it’s a huge convenience to be able to make them last longer. A smoothie is a bit easier with just a blender to clean up. I was juicing for awhile too but got sick of cleaning the juicer! 🙂 I heard Jordin Rubin speak a couple months ago and he mentioned he does bulk juicing and puts a small bit of honey in to preserve it. And I should totally get a jar sealer for my vacuum sealer! Love that tip!! We’ve been talking about juicing and getting a juicer here. We don’t buy juice from the store anymore and miss having it. Hi Kat, I tried juicing but I feel like I need the fiber as the juices gave me a sugar rush and then I was still hungry afterwards. i juiced celery, cucumber, carrots, beets, and apples. I would also add some spinach. Now I’m making green smoothies with my Vitamix. @Betty When I first did juicing, I did small amounts and always had them with meals. I couldn’t tolerate the fiber at all, but having them with a meal helped keep my blood sugar under control. You could also try adding some raw egg yolks, yogurt or kefir to the juices. Hi Kat, How long will my juice stay fresh if i just put in a jar and keep it in fridge without using this vaccum sealer. I just want to keep it fresh for 24 hours. Any suggestions? @Sal Hi, I would suggest filling a jar until it’s spilling out and then putting the lid on tight. This minimizes the contact with air. There will still be air mixed in with the juice (most juicers end up giving a ‘frothy’ juice) so it might not keep a full 24 hours. 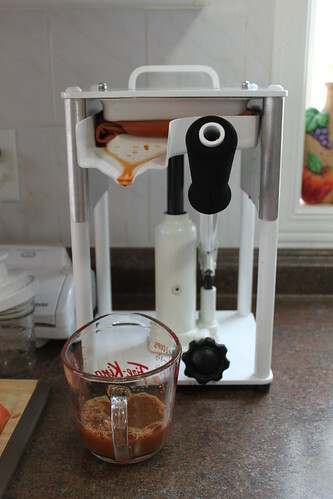 I found a site where you can build your own juice press for a fraction of the cost. Could you share the site. I have seen a couple over the years. using for this site? I’m getting fed up of WordPress because I’ve had issues with hackers and I’m looking at options for another platform. I would be great if you could point me in the direction of a good platform. Hi there, I think your web site could possibly be having internet browser compatibility problems. in a can, there may be metallic edges that can cut one’s mouth. You can only acquire a small amount of in-game money or gold, and cannot participate in the auction house, send mail, join guilds, or even whisper to someone unless someone whispers to you first. with the end within the action gains each of the perks. an activity could be the touch with the ‘glowing’ effects. your taste. s place, you are being him and you might be using the best you’ll be able to to get rid of and win the prize to be this type of nice player. Successfully complete the Evil Summit level with a “Gold” rank. it can be want to raise animals and crops within an animated cartoon like environment. Avoid ordering food for example spaghetti with red sauce. is into a babysitting job, playing the newborn video games would enrich the babysitter with essential insights on being a dependable babysitter. Each task needs a certain quantity of your energy to complete. The players can play in teams and must stand across from one another while they begin throwing the sock containing the egg to a single another. Interactive math games keep students engaged and dedicated to different tasks which can be asked them to perform. and so are looking out for some reviews before choosing themselves a chair. what you have to forget exactly about your troubles. Just press the DVR button and press #5 for Dish ONLINE. pc with a excellent checklist of high specifications for your price. The games that you simply play have an intricate role in how you will upgrade your PC for gaming. To comprehend the spirit of game ‘s what important. to decide to fashion one of your respective own, or decide to play with one from the world’s biggest golfing legends. Newer games are let go into the market every few months. Edition. Most computers will run fine using the stock sound card but who desires that. search for file type there. There are a few things we need to remember when purchasing our case. hot spot, the species, the tackle – the weather, its your game and your rules. ใช้เวลา เวลา ศึกษา มาก หรือ ทำงานออก เพิ่มเติม เพื่อ ที่ยอดเยี่ยม ข้อมูล ผมเคยเป็น มองหา นี้ ข้อมูล สำหรับภารกิจ ของฉัน . być zabiegi takie jak wydłużanie rzęs dzięki odżywkom do rzęs. rzęs, gdyż istnieje szeroka gama produktów powstałych dla wzmocnienia rzęs. bowiem istnieje znaczna gama towarów powstałych dla przedłużenia rzęs. is so popular. Figure out a schedule for how frequently you switch slots. This is great & looks so delish. Can’t wait to try them. Love recipes & ideas like this. Hey there, I have a question regarding juicing. I’m confused on how and when to introduce it. It seems like it is ok to add juicing in stage one, but I haven’t tried all the vegetables that I would juice yet. So is it ok to juice things that we haven’ added back yet? Thanks for clarifying. além disso, convém escolher sempre que possível às escadas (especialmente subi-las) do que elevador. Yes! I want to echo thank you for sharing!! Fermented vac sealed juice is a supreme idea! Along with drinking with meals. Maybe next time I can get this juicing thing down. The no colon shtick is getting me. cannot seem to tolerate fiber or juice yet. scd 2 years and at square 1. 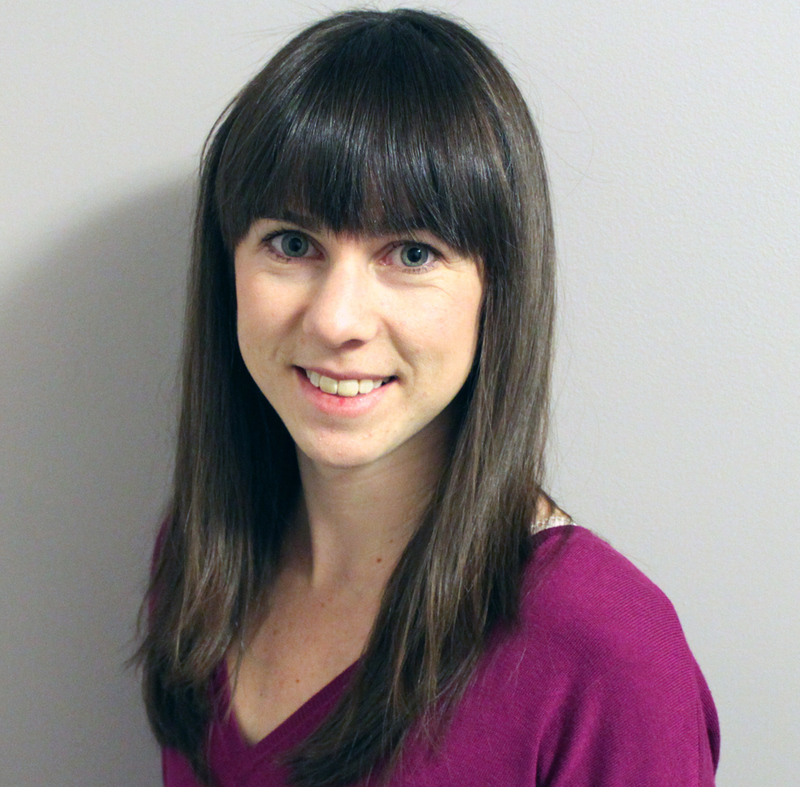 Your site is awesome and helpful!! maison, mais aussi ceux que vous préparerez en avance pour manger dehors. facility for people with special needs in Worms, Germany. But now that she is ‘not the youngest one on the stage,’ the great German violinist has become a mentor to a new generation of gifted young players. where they viewed manuscripts of Mozart, Mendelssohn and Brahms. as well as can be used essentially anywhere! Very good article.I definitely love this website. Keep it up! I’ve read stuff from. Thanks for posting when you’ve got the opportunity, Guess I’ll just bookmark this page. This publish truly made my day. You can not imagine simply how so much time I had spent for this information! Thank you!